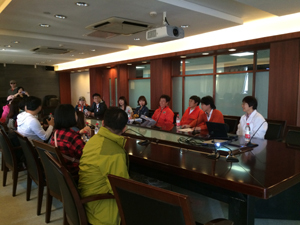 On October 16th 2014, a group of 17 medical professionals from Korea Gwangju Suwan hospital led by Professor Kin Heejoong visited our hospital. Gwangju Suwan hospital is a general private hospital which was found in 2012. The hospital has 300 inpatient beds. Orthopedics and Plastic & Cosmetology are the hospital's dominant departments. And other departments such as Internal Medicine and Surgery also enjoy good reputation in local area. There are about 500 outpatients visit the hospital every day, it shows considerable developing prospects in their country. Dr. Ge Beifen, The Director of International Communication & Collaboration Center in our hospital met the visiting delegation. Dr. Ge has introduced our hospital's strong characteristics and advantages to the guests, especially in traditional Chinese medicine and the combination with western medicine to treat many kinds of difficult?miscellaneous?diseases, achievements of scientific researches and international education of Chinese medicine. 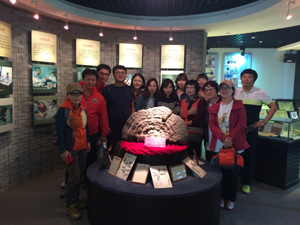 After the reception conference, the guests have visited clinics of Acupuncture, Tuina and TCM Internal Medicine and hospital historical museum. Our hospital's suppliment history and strong features of Chinese medicine with western medicine have left deep impression to the delegation. Professor, Kin Heejoong, Dean of Gwangju Suwan Hospital, has expressed strong interests to establish a long-term cooperation with our hospital, and hope to send his staff to our hospital for in further clinical training and advanced education in the future.